Whitey Mooshie dressed for Christmas. Seasons Greetings Furriends! We hopes wherever you live, you havin jolly good time and are in warm and snuggly homes. We wants to send good wishes and pawhugs to all da anipals who may be outs in da cold wif no family or in animal shelters. According to ASPCA, approximately 5 million to 7 million companion animals enter animal shelters nationwide every year and five out of ten dogs in shelters and seven out of ten cats in shelters are destroyed simply because there is no one to adopt them. 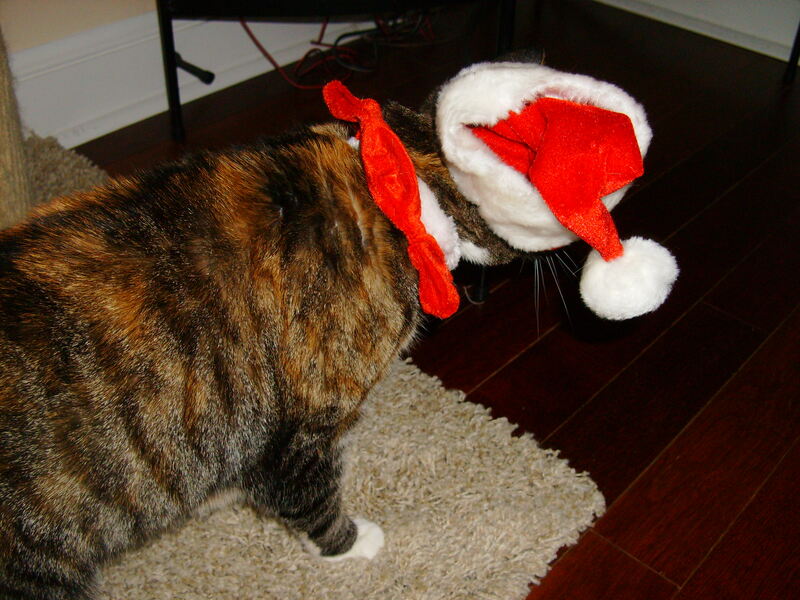 Marcella Mooshie as Santa Claws. These pals need our help. As much as we anipals luv treats from our hoomins, let’s remember our furriends in need. Maybe, you can ask your hoomin family to help da cats and dogs who have no home for da holidays. We bets there be lots of local animal shelters and charities in your communities. Just pick one and give a little donation, volunteer or help an anipal find a home. We know many of our Twitter pals came from purrty good shelters and rescue places. Our mommy found us through Alley Cat Allies. So, we fink it good to give back and help other kittehs and dogs. We wish efurrybody and dere hoomin families and friends happy holidays and a pawsome New Year. And we wish every anipal in a shelter or in da cold some love, food and new home wif nice families. This entry was posted on Tuesday, December 20th, 2011 at 2:28 am and is filed under Uncategorized. You can follow any responses to this entry through the RSS 2.0 feed. You can leave a response, or trackback from your own site.